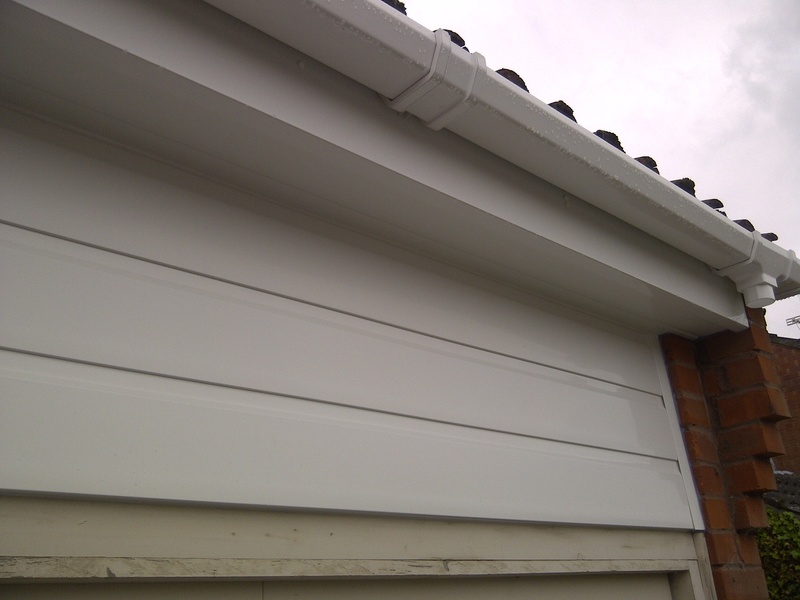 18mm Fascia board together with the martial tufflex range of guttering systems available in half round, square line or ogee, white, black or brown. 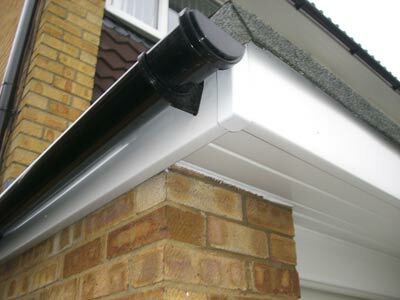 Other colours of guttering are available upon request. 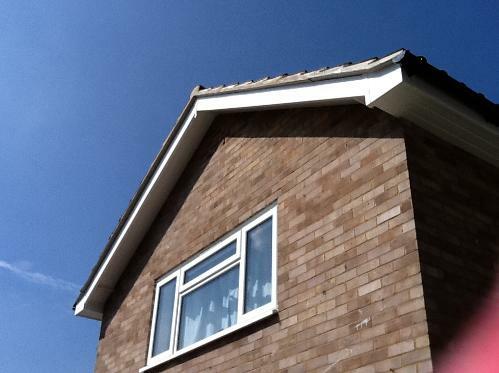 Current building regulations require loft ventilation for new buildings (equivalent to a one inch gap along the whole perimeter), we always ventilate your loft by installing overfascias ventilation on every installation. and All the debris is disposed safely. 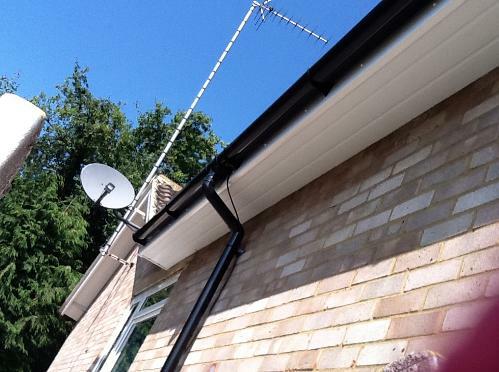 , Painting and Decoratoring quotation service,Patio quotations and installations,Plastering quotation, Plumbing quotation,Roofing quotation, Farnborough, Camberley, Cranleigh, Guildford, Fleet, Farnham, Hook, Old Basing, Basingstoke, Oakley, Winchester, Sandhurst, Staines, Epsom, Leatherhead, Send, Woking, Wimbledon, High Wycombe, Crowthorne, Addlestone, Godalming, Aldershot, Bentley, Dorney, Burnham Common, Wokingham, Newbury, Oxford, Marlow, Basingstoke, Andover, Winchester, Repair roof, fascia replacement price, price to repair fascias, cost to replace fascias and soffets, roofing repairs, roof repair, Roofline Fascias, Soffits, Guttering, replacment fascias, replacement fascias, 321 extension quotation, 321 lantern roof quotation, 321 PRICE ROOF REPAIRS, FASCIAS, ROOFING, INSTALLATION, FLEET, WOODLEY, TILEHURST, BRACKNELL, MAIDENHEAD, WARFIELD, HASLEMERE PETERSFIELD GODALMING, COOKHAM, CHOBHAM, COBHAM LEATHERHEAD, BURNHAM COMMON, Fascias,QUOTATIONS FOR FASCIAS, PRICES TO REPLACE FASCIA SOFFITS FASCIAS, windlesham, REPLACE GUTTERS, NEW GUTTERING AND FASCIA IN BRACKNELL, FLEET, WINNERSH, SONNING, CAMBERLEY, WOKING, READING, GUILDFORD, READING, MAIDENHEAD, HIGH WYCOMBE, fascia gutter price, quotation, replace fascias, quotation roofline, quotation fascia soffits, quote , FARNBOROUGH, BASINGSTOKE, WOKING, FARNHAM ASCOT, YOUR LOCAL FASCIA AND SOFFIT REPLACEMENT COMPANY, HARTLEY WINTNEY WINDLESHAM HASLEMERE PETERSFIELD, low cost guttering, fascias GODALMING, fascias COOKHAM, fascias CHOBHAM, fascias COBHAM LEATHERHEAD, BURNHAM COMMON, ONLINE fascia and soffit replacement PRICE, pvcu fascia prices, fascia and soffit price, Fleet Farnborough fascias, Odiham replacement fascias, Tilford replacement fascias, Churt replace gutters, Chilworth fascias and soffits, Ewhurst pvcu fascia price, Rudgwick prices to replace fascias and soffits, Effingham, Oxshott, Ashstead, pvcu fascia price Claygate, pvcu fascia price East Molesey, Kingston upon Thames, Sunbury, Thatcham, Basingstoke, Guildford, Farnborough, Woodley, Reading, Basingstoke, Farnham, Farnborough, Camberley, Cranleigh, Guildford, Fleet, Farnham, Hook, pvcu fascia price Old Basing, Basingstoke, Oakley, Winchester, Sandhurst, Staines, Epsom, Leatherhead, Send, Woking, pvcu fascia price Wimbledon, High Wycombe, Crowthorne, Addlestone, Godalming, Aldershot, Bentley, pvcu fascia price Dorney, Burnham Common, Wokingham, Newbury, Oxford, Marlow, pvcu fascia price Basingstoke, Andover, Winchester, Romsey, Bordon, Yateley, price for pvc fascias Wasing, Reading, Chieveley, Burleigh, Barkham, Hurst, Lightwater, pvcu fascia price Windlesham, Wentworth, Sunningdale, Bookham, Oxshott, Weybridge, West Byfleet, JUST SEND US A PICTURE OF ALL AREAS OF YOUR HOME AND WE WILL GIVE AN APPROXIMATE PRICE SUBJECT TO ACTUAL SURVEY, FREE QUOTATIONS ON SITE.